Nebraska Furniture Mart catalog is an easy way for you to shop expertly arranged room designs and stylish furniture selections online. You'll find smart looks in living room and bedroom furniture paired with beautiful home décor accessories. Furniture and Home Decor - Find the style you want for your home in their huge selection of name brand furnishings, with complete room setups for contemporary, casual, modern and mission interiors. Whether your style is eclectic or specific, you will love living room, dining room, bedroom and kids room designs from furniture manufacturers like Benchcraft, Ashley, Broyhill, Stone & Leigh and hundreds more. They have beautiful upholstered chairs and sofas to furnish the ultimately inviting living or family space, rich wood tables and dressers, and brand name mattresses, as well as versatile cupboards, entertainment centers and baby furniture. Appliances, Computers and Electronics - Shop for the lowest prices and hot no-interest financing on the kitchen appliances you need, with the latest finishes and designs in cooktops, refrigerators, dishwashers and small appliances. You will also find the appliances you want for your gourmet kitchen, like warming drawers, Viking ranges, and KitchenAid wall ovens. Then, head over to electronics and computers to equip your home theater, office and man cave with both the necessities and luxuries you need for the way you enjoy to entertain. 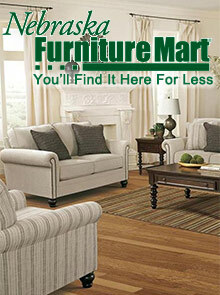 Home Decor - From your floors to the windows, Nebraska Furniture Mart has you covered. You will find more than 21,000 area rugs, a beautiful selection of mosaic and glass tile, and thousands of hardwood flooring products. The Nebraska Furniture Mart catalog also seasonal décor, home accents, window treatments, mirrors and wall hangings to add the finishing touch to your home decoration. Need help organizing and storing your belongings, too? They have all of the solutions you need. Outdoor Furniture - Take your living outdoors with dining sets, outdoor fountains, weather resistant curtains, cushions and rugs. You will love the extended entertaining and relaxing space you get when you add an outdoor cooking area with a top rated gas grill, a fire pit for conversation, and practical outdoor storage. From the pool to the veranda, you will find finishing touches and comfortable furnishings your entire will enjoy all year round. Take a closer look and discover the best in home appliances and electronics at legendary low prices in the Nebraska Furniture Mart catalog, and save big with the coupon code savings for every room and outdoor space in your home.